She's young, she's smart, she's beautiful, and she can sing. Just 24, Sophie Milman is already being compared to Diana Krall, Sarah Vaughan, and Ella Fitzgerald. Her debut CD has sold more than 100,000 copies and her latest is winning raves. She's been called a "hottie" and a "doll-eyed blonde." It must be hard to follow your own press onto a new stage in a new town; when expectations are that high, the pressure's on. But Milman exuded confidence and the only hint of her youth (other than her fresh and dewy looks) was a tendency to talk a bit too much about herself between songs. Her band was terrific. Who are these guys? Where are they from? From the IAJE Web site, I learned that Wallis hails from Winnipeg, lives in Montreal, and earned his Master of Music and Bachelor of Music from McGill. Shrofel and Wallis have made a CD together called OneUpOneDown; brief bios on that site tell me that Shrofel "is a well trained and versatile musician comfortable in a variety of musical settings." Thanks for nothing. IAJE says that Shrofel is based in Montreal as well. It seems that George Koller is also a member of a Toronto band called the Shuffle Demons, though it's hard to be certain because his photo there shows him wearing a hat and a beard, and neither were in evidence last night. (Is Koller Milman's regular bass player? Recent articles name bassist Kieran Overs as the newest addition to Milman's band.) John Fraboni is part of the Montreal jazz scene, and that's all I can find about him. We saw the second set on the final night of a two-day stay at the Dakota. The band opened and Millman came out for the second tune, jumping right into Jobim's "Agua De Beber" (ba-ba-du-da, baya-duba-duya). She sang songs from her self-titled debut CD: "My Heart Belongs to Daddy," "My Baby Just Cares for Me," the Russian folk song "Ochi Chornye" (in Russian, which she still speaks at home with her parents; the family emigrated from Russia to Israel when Milman was six, and from Israel to Canada when she was 16). We also heard songs from her new CD, Make Someone Happy: "Matchmaker, Matchmaker," "Undun." Her performance wasn't limited to her recordings; she performed a two-song tribute to Oscar Peterson, "Tenderly" and "Sweet Georgia Brown," and an interesting jazz arrangement (Wallis's?) of Bruce Springsteen's "I'm on Fire." "Agua De Beber," was lovely, "My Heart Belongs to Daddy" kittenish. I could have done without a jazz version of the song from Fiddler on the Roof. "I'm on Fire" has the potential to become the next "Fever." I can imagine a lot of jazz singers performing this song. When Kurt Elling sings "Undun" (the late '60s pop hit by Canadian rock supergroup The Guess Who), he slows it way down; Milman speeds it up, and I think I prefer Elling's reading. Which isn't fair to say since I prefer Elling's reading of almost anything, although I hope he never sings "MacArthur Park." 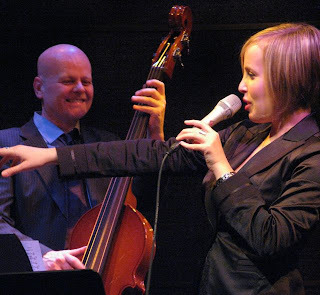 Previewing Milman's show for the Strib, the usually astute and perspicacious Jon Bream wrote, "You could easily mistake Sophie Milman for the daughter that Twin Cities jazz thrush Connie Evingson never had." I thought that was a boneheaded thing to write for at least two reasons, but having seen Milman, I can understand why he wrote it (although it was still boneheaded): She looks kind of like Connie, and she sings kind of like Connie. Who was not at the Dakota when we were, although Christine Rosholt was. I expected to see more singers in the house. Maybe they came to the earlier shows? A close approximation of Millman's band (with Overs on bass instead of Koller). Sophie sings "Agua De Beber." Photo: Koller, Milman. Sorry, Sophie, not the best photo. My card reader ate several images.